What is a Display Select Campaign? As one of the lead search marketers here at Zion & Zion, I’m plugged into many of the new features that Google is frequently testing out and launching. Sometimes, there are so many new products and features being released that it can be hard for those without a direct relationship with Google to keep up, which is exactly why I’ve written this article, so enjoy. A good while back, Google AdWords released a new campaign format that took a couple of years to pick up steam in the online marketing world. In this article I’ll take you through what this “new-ish” campaign is, how you can set one up, and give you a few ways to optimize your campaign for the best performance. Back in 2014, Google started to roll out a new campaign called Search Campaign with Display Select, sometimes shortened to Display Select Keywords or DSK. Previously they had “Search Companion Marketing,” which was kind of “hush hush” if you had access to it, as it was a beta test they ran for quite a while. If you were part of the secret group of marketers with access to this, you would know not too much has changed in their recent unveiling of Display Select. Through Display Select, advertisers are able to run a display campaign across pages Google has deemed most relevant to their keywords. These sites, according to Google, are where the most interested users are, giving advertisers an audience that’s typically hard to reach with just normal contextual advertising. Campaigns run through DSK may see up to a 15% increase in conversions because these pages have more engaged users. Rather than having ads show on pages that may be relevant, or closely relevant to your keywords, Google will show ads on pages that actually are relevant. To help you better understand where an ad in a Display Select campaign may show up, we’ll use the plumbing industry as an example. Say you run a paid search campaign for a local plumbing company, whose main goal is to drive plumbing service leads through form fills or phone calls. From general industry knowledge, you know there are people who would rather research some DIY sites to try and fix a plumbing issue themselves before they call a company to come out and do the work for them. The process typically goes something like this: people search “fix plumbing” on Google, scroll right past your ad, and click on an organic listing to figure out if they can do it themselves. Then they go to a DIY blog with tips on how to find the issue and start reading the “suggested” solutions. Once they start reading these “solutions,” they realize it is much more work than they expected—and they would rather call the first plumber they come across. But before leaving the page, they notice a little banner ad next to the solutions section showcasing your local plumbing client, complete with an offer to repair plumbing issues. At this point they may decide they’re ready to call you right then and there. Or they may make their way back to Google, see your paid search ad, recognize the company name from the banner they just saw, and call you up. 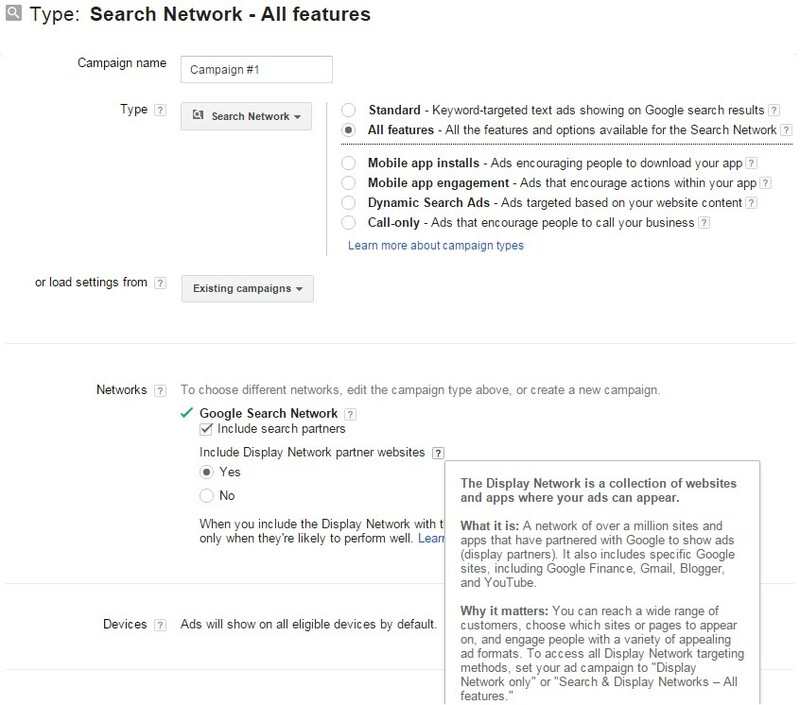 Before you can even start setting up your first Search Network with Display Select campaign, you will need to make sure your account is eligible to do so. Since this is a newer AdWords product, not all advertisers have been given access to it. There may be some eligibility requirements, as well. To see if you have it available, click “+Campaign” within the Campaigns tab, opening the drop down menu of different campaign types. 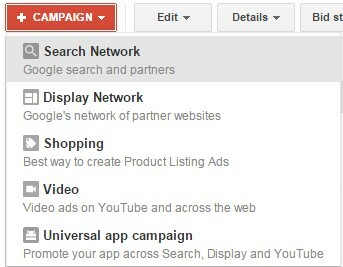 Click Search Network which should bring you to the setup page for the campaign. If you have the option under Networks to check Include search partners, as well as the option for Include Display Network partner sites you are good to go. If not, you will need to reach out to your Google account team or representative to be added to the Display Select list. When setting up your campaign, you will want to input the location settings, ad schedules, budgets, and any other settings you’d typically use for a display or paid search campaign. Once you have the shell of your campaign built, it’s time to move on to your keyword list. With Display Select, you want your ads to be as relevant as possible on the pages they may show up on. Treat this list as an exact match keyword list. Adding in keywords that directly align both with what your ad is getting across, and what your potential customer is looking for, will be the best way to make sure your ads are as relevant as possible. If you’re currently running a paid search campaign for your business, use your existing keyword list to build your DSK list. Look for keywords in your list that may get a lot of impressions, but are also more competitive and generally have higher cost-per-clicks. While these may still end up being some of your more costly keywords in your DSK campaign, they will increase the likelihood of your ad appearing on more frequented pages—and may still cost less than a paid search ad for the same keyword. Add keywords your customers may use while researching your product or service, even though you may have strayed from these keywords on the paid search side. Using the plumbing example again, you may not want a paid search ad to show when someone searches “how to fix my clogged drain,” but for DSK you may want your banner ad to show on the sites your potential customer ends up on while trying to fix the problem themselves. As with any search or display campaign, you will want to ensure from the start that your ads aren’t showing on sites you wouldn’t want your business to be on. Google AdWords allows you to block sites and webpages that may contain adult content, content related to death or tragedy, as well error pages or parked domains. Like any paid search campaign, you’ll also want to make sure your ads aren’t showing for keywords you don’t want them to show for. Using plumbing as an example again, blocking the words “rip-off,” “scam,” and “lawsuit” will ensure your ads aren’t showing when someone does a search including these keywords. Unless you are the “set it and leave” type of marketer (which for your client’s sake, I really hope not) the keys to success for your Display Select campaign are monitoring and optimizing. As it should be with all of your digital campaigns, the first thing you want to check before making any real optimizations is to make sure everything is running properly. Are your ads showing where they’re supposed to be showing? Are they showing where you don’t want them to be? Are your URLs still working properly? After you’re sure your campaign is functioning properly, it’s time to monitor performance and optimize. When it comes to monitoring and optimizing for performance, this is going to vary business to business and even campaign to campaign, depending on things like your campaign goals and objectives, budgets, and even industry. If your goal is getting people to your website to fill out a form, call your business, or sign up for an email, you’ll want to be sure you have conversion tracking enabled throughout your landing page and website, and that this is connected to AdWords. From this you can determine if you should remove keywords that aren’t converting, increase bids on keywords that are converting, or maybe add variations of a keyword that converts well to see how it does in comparison. Another way to monitor and optimize your campaign is looking at the click-through-rates and view-through conversions of your ads. If a certain ad size has low CTRs and VTCs, consider possibly pausing this size or creating a second ad of the same size to test the ad content. If you have a branded paid search campaign running for your business, monitoring impressions is a way for you to see if there’s an overall increase in searches for your brand after someone may have seen your ads on a webpage and came back looking for you. Of course, this is based on the assumptions that your company didn’t launch or change any other marketing that may increase brand searches, and that a user actually did go back to Google looking for your brand after seeing an ad rather than typing in your website directly. With Display Select campaigns through AdWords, you have the opportunity to increase conversions and ROI by running display ads across highly relevant webpages with high converting users.